Ministers want to transform the NHS from a comprehensive health service into a fund which purchases services from a range of providers - mainly not for profit "social enterprises" and Foundation Trusts, or for-profit private companies running Treatment Centres, hospitals, outpatient and diagnostic services, and primary care. This would create a full-scale "market" in health care even more chaotic and wasteful than the "internal market" system hatched up from the Thatcher reforms 18 years ago. The key features of this market are also the key issues on the government's "reform" agenda, and key challenges to UNISON and the health unions. 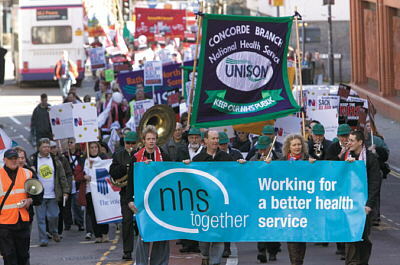 UNISON banners prominent on protest through Bristol. Primary Care Trusts provide a an important range of services themselves, but also control budgets adding up to a massive £64 billion in England. Since 2005 there have been proposals for them to hive off their directly-provided services to private or non-profit organisations - and to hand over some or all of their "commissioning" to private companies, most likely to large health insurance companies from the US such as United Health. In Hillingdon, where PCT deficits hit a crazy £57 million, incoming "troubleshooter" Chief Exec Anthony Sumara has proposed to privatise 90% of the PCT's work, including the commissioning. The majority of hospital treatment is now financed through this system which pays a fixed, standardised fee for each item of treatment delivered by NHS hospitals, but which does not apply to contracts with private hospitals and Treatment Centres. PBR replaced a system of block contracts, and it is a device to siphon a growing share of NHS budgets out of the public sector and into private providers. 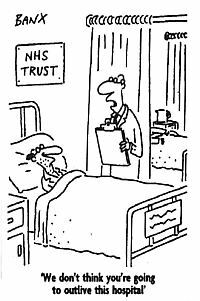 Every patient who opts - or is compelled - to seek treatment in the private sector takes the money with them out of the NHS, leaving NHS Trusts struggling to balance their books and uncertain on any longer-term plans. These new units are now scooping an every growing share of NHS budgets, with new centres due to come on stream, despite concerns over the clinical quality of their work. ISTCs deal only with the most minor cases, leaving all the more complex and costly cases to the NHS: but they receive more than the NHS tariff price for treatment and have guaranteed income and guaranteed profits for 3-5 years ahead. There has been talk of ISTCs standing as "competition" for the NHS, but NHS trusts are still barred from bidding for Treatment Centre contracts. And far from increasing overall capacity, the second wave of ISTCs are seen as transferring work from the NHS - with the possibility of using NHS facilities and even seconded NHS staff. More clinical services are being handed over to private providers including dialysis services and increased numbers of diagnostic and imaging procedures - although again the private sector insists on taking only the least complex caseload. GP services too are facing increased pressure, as PCTs invite for-profit private companies to bid for contracts in "hard to doctor" areas. Despite a succession of reports and revelations exposing the lack of any evidence that it represents value for money, the Private Finance Initiative remains the principal source of funding for new hospitals, with another string of schemes recently rubber-stamped amid concerns over affordability. The soaraway costs of PFI mean that many of the most recently approved schemes had been drastically scaled down, and others face big cutbacks or in some cases have been scrapped altogether. Many of the operational PFIs have faced financial crisis, with a number of them including Coventry's new Wallsgrave Hospital running with beds, services or whole floors unoccupied to save money. The policy that just squeaked through the Commons with the backing of Welsh and Scottish MPs who knew the policy would not affect their constituents has led to over 50 hospitals now operating outside the control of the NHS, accountable only to the "independent regulator", Monitor, which in turn is largely run by private sector management consultants from McKinsey's. Foundation status has been shown to deliver neither the freedom to borrow which many had expected nor the financial stability which others had hoped for: Foundations are still dependent upon the purchasing decisions of PCTs, and several have resorted to bed closures, job losses and service cuts. The first mental health Foundation Trust, South London & Maudsley, has been facing a continuous stream of service cuts since its launch, as a result of Lambeth & Southwark PCTs. Ministers have said they want all Trusts to become Foundations by 2008: but to achieve this a number of indebted Trusts will have to break all the rules on requiring financial viability. This so-called "third sector" alternative is a soft privatisation, creating an organisation that runs like a private company and must deliver surpluses but is forbidden to distribute this to shareholders. There is no basis to believe that social enterprises would in practice be any more accountable or accessible either to service users and the wider public, or to staff: the largest social enterprise so far in the NHS, Central Surrey health, was established in the teeth of a ballot which showed 84% of staff opposed to the switch. NHS staff transferred to a social enterprise would almost certainly lose their right to belong to the NHS pension scheme, and while some terms and conditions would be retained under TUPE regulations, the new employer could simply give notice and revise all or any of the more beneficial conditions such as NHS sickness benefit. In trying to sell unpopular plans to downsize and downgrade local hospital services and centralise in fewer units, ministers and health chiefs have relied heavily on superficial reports. These include one from the NHS Confederation (which used outdated figures and ignored current trends) and the Blairite Institute of Public Policy Research (which proposed closing over 50 A&E units, including FIVE in NW London, without addressing the question of where the displaced patients were expected to go instead). Hoary old clichés such as "better care closer to home" and "fit for the future" have been wheeled out to cover up the unpalatable truth of fewer hospitals further from most people who need them, and little if any plan for adequate investment in alternative community-based services. Patricia Hewitt recently declared that there should be an end to the process that has seen mental health and other services for vulnerable groups axed to save money towards budget deficits elsewhere in the NHS. But even as she spoke Camden & Islington Mental Health Trust was unveiling a new devastating package of cuts driven by PCT decisions to cut spending. These new mega-quangos have just been merged and their powers expanded to give them control over the allocation of ISTC contracts. The new SHAs are even less democratic and less accountable than the previous bodies they replaced, but control vast budgets and services for millions of people. In London a new highpowered "nightmare team" of pro-market fanatics with private sector links has been established in the top hierarchy of the new SHA bringing the threat of brutal changes to come with the publication of a "review" later in the year. Patricia Hewitt grabbed the headlines with what appeared to be a bold promise at the beginning of April - pledging that every woman who wanted to do so could have her baby at home by 2009. In fact midwife shortages are driving a relentless process of centralisation and rationalisation that mean women are forced to travel further and further to have their babies in large factory-style units, while popular midwife-led units are among those under threat, with over 40 smaller units facing closure.